With the use of MSU Perceptual Video Quality Tool it is possible to conduct subjective measurements with six different methods. These methods are described below. This method is described in ITU-R BT.500-11. In type I videos are played in pairs in one playback window. Each pair is repeated a given amount of times ("repetition" parameter in the Task Manager). During playback expert is free to switch between two videos, named "Sequence A" and "Sequence B" by pressing Tab button. One of videos is the reference one, but expert is not informed about it. After playback expert is asked to give his opinion about each video sequence. 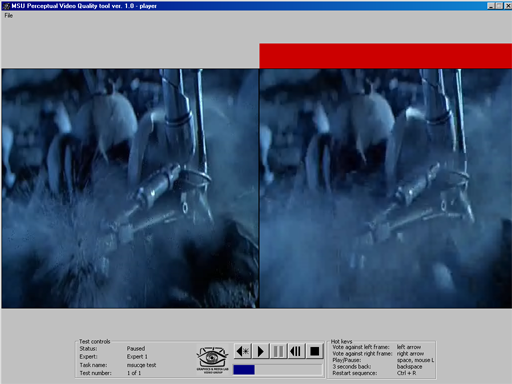 In type II (which is used more often) videos are played in pairs, and both videos are shown simultaneously. Each pair is repeated a given amount of times ("repetition" parameter in the Task Manager). As in type I, one of videos is the reference one, but expert is not informed about it. Impairment scale is the same as in type I. This new method was created by EBU and was recently sent for standartization. During test procedure expert is able to play any sequence from the test set and give it mark, plus he is able to play reference video. Mark is in the range from 0 to 100. This method implements idea of continuous evaluation: two sequences are played simultaneously, and if during playback expert thinks that one sequence is worse than another, he should click left or right arrow button on his keyboard, depending on a position of the sequence he dislikes. In this case red mark appears on top of the video the expert is voting against.